Retention prediction based on molecular structure (R.M. Smith). 2. Retention prediction of pharmaceutical compounds (K. Valkó). 3. Retention index scales used in high-performance liquid chromatography (R.M. Smith). 4. Application of retention indices for identification in high-performance liquid chromatography (R.M. Smith). 5. Application of nitroalkanes and secondary retention index standards for the identification of drugs (M. Bogusz). 6. Identification using retention indices in gradient HPLC (P. Kuronen). 7. Characterization of retention and selectivity in reversed-phase LC using interaction indices (P. Jandera). 8. Lipophilic and polar indices (P. Jandera). 9. Solvent selectivity (S.D. West). 10. Retention and selectivity for polycyclic aromatic hydrocarbons in reversed-phase liquid chromatography (L.C. Sander, S.A. Wise). 11. Comparison of novel stationary phases (J.J. Pesek, E.J. Williamsen). 12. Multivariate characterization of RP-HPLC stationary phases (A. Bolck, A.K. Smilde). Subject index. 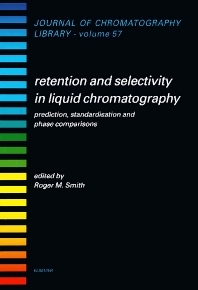 This book brings together a number of studies which examine the ways in which the retention and selectivity of separations in high-performance liquid chromatography are dependent on the chemical structure of the analytes and the properties of the stationary and mobile phases. Although previous authors have described the optimisation of separations by alteration of the mobile phase, little emphasis has previously been reported of the influence of the structure and properties of the analyte. The initial chapters describe methods based on retention index group increments and log P increments for the prediction of the retention of analytes and the ways in which these factors are influenced by mobile phases and intramolecular interactions. The values of a wide range of group increments in different eluents are tabulated. Different scales of retention indices in liquid chromatography are described for the comparison of separations, the identification of analytes and the comparison of stationary phases. Applications of these methods in the pharmaceutical, toxicology, forensic, metabolism, environmental, food and other fields are reviewed. The effects of different mobile phases on the selectivity of the retention indices are reported. A compilation of sources of reported retention index values are given. Methods for the comparison of stationary phases based on the interactions of different analytes are covered, including lipophilic and polar indices, shape selectivity comparisons, their application to novel stationary phases, and chemometric methods for column comparisons.